Acer has announced the arrival of the Acer Iconia – a dual touchscreen tablet that's been created in close collaboration with Microsoft. The device is a curious one. It looks like a laptop but is very much a tablet hybrid. There's no mouse or traditional keyboard. Instead either screen can act as a virtual keyboard. The tablet/laptop is powered by Windows 7 Home Premium and is packing some not-too shabby specs. These include: an Intel Core i5-480 chip, 4GB of RAM (par for the course on a Windows 7 machine), 640GB storage and a four-cell battery. It's the four-cell battery that is a worry – Acer has told TechRadar that you will get around three hours' play out of it. This means that you will be mostly using the Acer Iconia as a desktop replacement, rather than a carry everywhere tablet device. Connectivity on the Acer Iconia comes in the form of three USBs, one of which is USB 3.0, HDMI and there's 3G and Wi-Fi on board. The two screens are both 720p, so great for watching movies on, and can be used completely independently of each other. 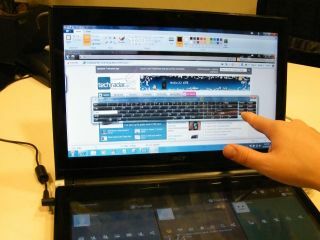 Acer has added an overlay to Windows 7 that's called Acer Ring. This is where you have access to all your of your media, like movies, pictures and social networking. The Acer Iconia dual touchscreen tablet has a UK release date of 16 January and will cost £1,500.